Compatible with 802.11g Wireless Lan Equipment and extends the range of 2.4 GHz Wireless Radio Devices. With a built-in Power Over Ethernet Interface, this amplifier is compatible with 802.11g Wireless Lan equipment and extends the range of 2.4 GHz Wireless Radio Devices. By using this amplifier, you can eliminate the need of the POE adapter, which simplifies the installation. This 250mW POE amplfiier transmits power up to 300 feet of distance between the amplifier and the power source. 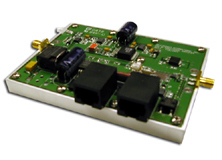 This amplifier has a transmit gain of up to 20dBm and the dimensions are 4.15" L x 3.15 " W x 1.00" H.